I work with a lot of medical professionals, from GPs to nurses and physios to dieticians, and even though most of them should know better there is still a gap between the “healthy eating” that they usually prescribe you and the “healthy eating” that Personal Trainers usually tell people to go for. Personal Trainers almost immediately tell someone to “Go Low-carb” and that “the eat-well plate is non-sense or wrong”where as General Practioners and most doctors tell someone to go with the Eat-well plate and that “low-carb diets are dangerous”. Eat well plate for those of you unfamiliar with it. Unsurprisingly they are both wrong. Whenever you hear someone say that a certain way of eating that has been around for years can just be discarded it is safe to assume they have no idea what they are talking about or are massively oversimplifying something. I always tell people to “eat for what you want”. If you want to lose fat you will have to eat differently from someone who is trying to gain muscle. If you want to train like an athlete you will have to eat differently from someone who is not active. This does not mean “eat more” but it also means “eat different foods and have a different macro-split”. Just an example of a macro-split. “But I thought eating fatty foods made me fat!?”. No, this is wrong. Over consumption of calories will lead to you getting fat but the main contributor to the fat storage are carbs. “So this means that everyone should go low-carb, all the time”. Only if you are trying to lose fat. A Low-carb diet is not meant to be a permanent life-style. 2; You’re trying to gain muscle-mass. This means that you will need to increase your protein intake. Protein builds muscle. Increase the protein intake and, combined with the right exercise, you’ll get bigger muscles. 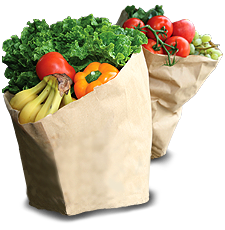 Anywhere between 1.5 and 2 grams of protein per Kg of musclemass is considered to be sufficient for most people. “So if I’m very muscular I should eat more protein”Yes you should but only because more of your bodyweight is muscle. To maintain your muscle-mass you should drop to eating approx 1gram of protein per Kg of bodyweight again. Only if you’re looking to gain muscle should you be eating 1.5-2grams per Kg of musclemass. 3; You’re perfectly happy maintaining your bodyfat % and weight and just want to eat healthy. This is by far the most interesting state and this is one that’s constantly being discussed. 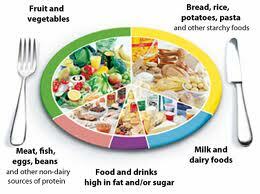 This is what the “eat-well” plate is based on. GPs and doctors generally only worry about homeostatis; IOW, they want to make sure you’re fit enough to do a desk-job and aren’t going to keel over from a heart-attack when you’re 40. Doctors, and most dieticians, don’t recommend to eat a certain way for those who train a lot. That’s what specialists, and well-trained and certified Personal Trainers, do. I like a 30% carb, 40% protein, 30% fats split (healthy fats obviously) but you can move these figures about a bit depending on what suits you. Say he’s a very smart guy and gets fast results (IOW, he trains with Castle) and he then decides to lose a bit of fat but maintain his musclemass as he’s happy with that. This now means he needs to drop his protein intake to approx 1gram of protein per Kg of musclemass AND he needs to drop his carbohydrate intake. Finally he has achieved his results and is delighted with his progress and body (Like everyone training with us is 😉 ). He now needs to maintain at 1g of protein per Kg and needs to go up to a maintenance level of carbohydrates. You can see from the above that he has needed to change his diet 3x already. If he decides he wants to train for endurance events or power events he will need to change his diet, and training again. Healthy but not always right. There is no “one magical way” to eat for the rest of your life. We all know that when you get older your metabolism changes dramatically. This is why we at Castle work with PERSONALISED nutrition plans and not the generic junk you get from other Personal Trainers. You eat for what you want, not for what you have if you need help with this, get in touch. Hi, I really highly recommend Jennova’s blog..there is a tonne of knowledge in there and she has always done her research. This entry was posted on 14/10/2013 by Peter @ Castlepersonaltraining.com and tagged Corstorphine, Diet advice, Edinburgh, fat loss, home, low-carb, muscle gain, personal trainer, Personal Training, weightloss.